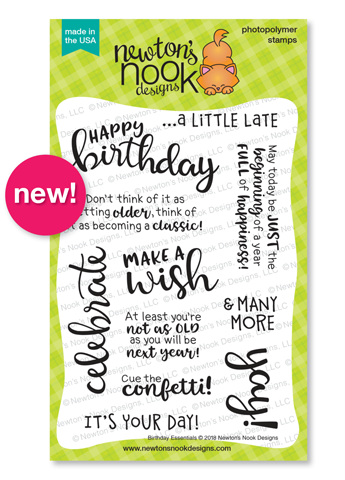 Welcome back for the last day of the March Release from Newton’s Nook Designs. 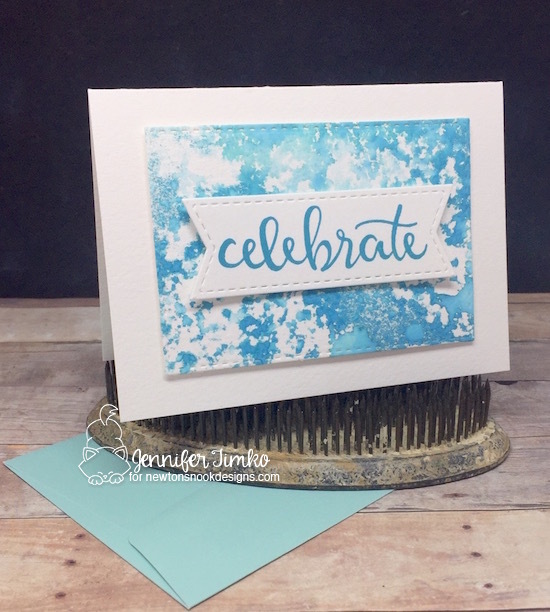 For our final reveal I have what you are sure to see as a “work horse” stamp set…a wonderful sentiment set called Birthday Essentials. So I have a confession to make. My name is Jennifer and I’m a sentiment hoarder. I love sentiment sets. I “collect” sentiment sets. Having just the right ones for inside and outside the card is simply a quest so I hold on to them even as I let images go now and then. So when a set that is all about birthdays comes along, you can bet that I’m doing a happy dance. Another truth (because, hey it is just among friends)…I never seem to have enough masculine cards. Perhaps it is because Kitty Kate and I are outnumbered. Perhaps it is my obsession with cute images and all flowers. But somehow, when it comes time to reach for a card for man, I don’t have the right one. So I committed to making one (and I’ll be making a few more just like it). 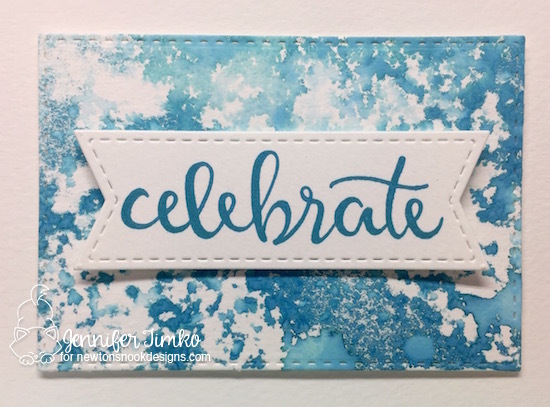 I felt like I need a cool background so I used this fun Magic Stamp by Clearsnap. It allows you to make your own background and just stamp. I was playing with it on my trip to Kansas and the incredible Jen Shults (yes, I did just name drop) suggested I press it into some concrete on the sidewalk. And I got this texture. Cool!! I inked it up with Distress Oxide Ink and just stamped onto watercolor paper, then spritzed with a little water. This big bold sentiment (which fits perfectly onto the Frames and Flags Die banner) becomes the focus and I have a fabulous, non-girly, no bling birthday card. Yay!!! And while this is super clean, the great script sentiment makes this still feel special. Birthday Essentials for the win!! I hope you like this card idea and I’m just sure you will love everything the team made for today. Now one more time for this release… A chance to win!! Would you like to win the “Birthday Essentials” Stamp Set? Comment on the NND blog and Design Team blogs (see list below)! The winner will be chosen at random from the collective reveal posts. Make sure to check out each of their blogs and comment for your chance to win. You will not know which blog has been chosen so the more you comment on the better your chances are of winning! You have until Thursday, March 15th at 9pm CST to comment — winners will be announced on the blog post on Friday, March 16th. Love the inspiration! Thank you! LOL! I’m glad to help with your sentiment addiction! And I agree, there are never enough masculine cards in my stash either! Great idea on this one! Gorgeous card and beautiful use of these new products!!! I too am an almost-hoarder of sentiment stamps (well stamps in general). But this set is special! I will be buying it! And probably the confetti stencil. So cute. Love the background and the big sentiment on the banner. Love! Gorgeous background. Love the simple design and palette. Wonderful card! I love the background – compliments and highlights the sentiment so well! Super fun card, Jennifer! This is definitely a great stamp set to have in my stash!!! Love the look of the background and I also love the big sentiment! Pretty background and ‘celebrate’ banner! Love your festive card! of the sentiment; so pretty! Love everything about your card — the background, color, sentiment — everything!! That’s a gorgeous background! Love the bold sentiment. So pretty Jen! Miss you lots! Your card is beautiful and very elegant !